I made these after our family had taco night, so I already had the meat and rice made! I just doubled all my ingredients, then put these together after dinner! 1. Cook ground beef, drain grease. Add taco seasoning and water, and cook until water is absorbed. 2. Add oil in medium pan, cook rice until slightly brown. Add chicken broth and salsa & bring to boil, then reduce and Cook for 15 min. Turn off heat and let sit for 5 minutes. 4. Soften tortillas by warming in microwave. 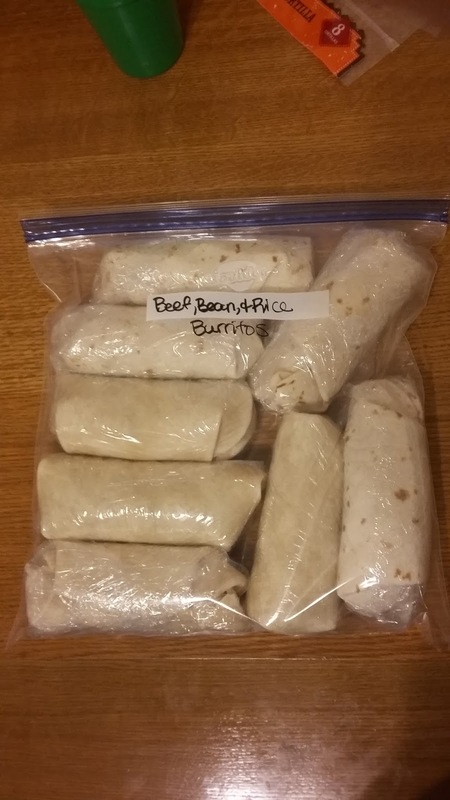 Assemble burritos by adding about two spoonfuls of beef, beans, and rice. 5. Roll burritos and wrap in plastic wrap. Store in freezer grade ziploc bag. Remove plastic wrap, and microwave for 1 to 2 minutes. Sometimes I poke the middle once with a fork to make sure it heats evenly.